From a young age, Basque Culture has been a part of my life. As a little girl, my mom told me about my heritage. My great-grandfather and great-grandmother had been born and raised in the Basque country, but finally decided to pursue the American Dream. They landed in Winnemucca, Nevada, a city known for its Basque descendants. As a child I did not truly see the significance of my heritage. However, as I got older, I knew I wanted to study abroad in San Sebastián, Spain to learn more about my heritage. The months prior to my departure, I prepared, I read, I researched. However, I never truly realized the impact these four months would have on my life. 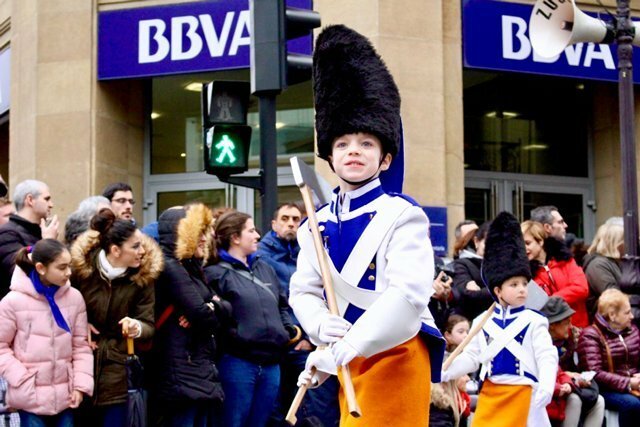 San Sebastián’s culture differs from much of Spain. A beach-side town located in Northern Spain, San Sebastián offers a small city atmosphere, rich in culture and history. Basque history in Spain does not have a true date of origin, however it is believed that they have been around for over five-thousand years. The Basque language – also known as Euskera– itself is unique. Unlike many European languages, Basque does not stem from Latin or Greek roots – rather, it is entirely its own. Nowadays, Euskera is spoken throughout San Sebástian just as much, if not more than Spanish. Basque history intertwined with Spanish history is a gruesome one. In the 1930’s the Spanish Civil War broke out – the radical Republicans and the military against the democratically-elected government. At the forefront was Franco. Franco soon came into power as dictator of Spain. A follower of both Hitler and Mussolini, Franco believed in solely Spanish culture and society. As a result, Basque culture was ultimately outlawed. Speaking in Basque, portraying that you were Basque, representing Basque culture was all considered illegal. If you refused to follow the law, you would be imprisoned. In 1937, on the brink of World War II, Nazi Germany began to accumulate arms and practice for the future. During the same time period, Spain happened to be in their Civil War. On one side was Franco and the Radical Republicans, and on the other, the Nationalists and the Basque. As an avid ally, Franco allowed Hitler to utilize his bomb practice within Spain. 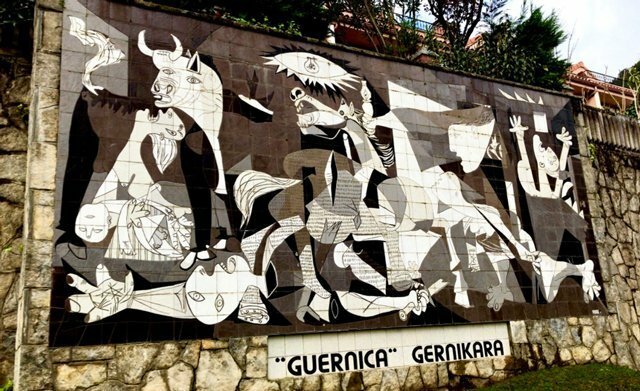 Guernica – a small town rich in Basque history and culture – was obliterated. This came as a devastation, not only to Basque society, but Spain as a whole. This was ultimately the first time a massive group of citizens had been brutally effected by an armed force. After the devastation to small Basque town, Pablo Picasso made a masterpiece – known as Guernica. The painting depicts the devastation and horrors of wars and their results. 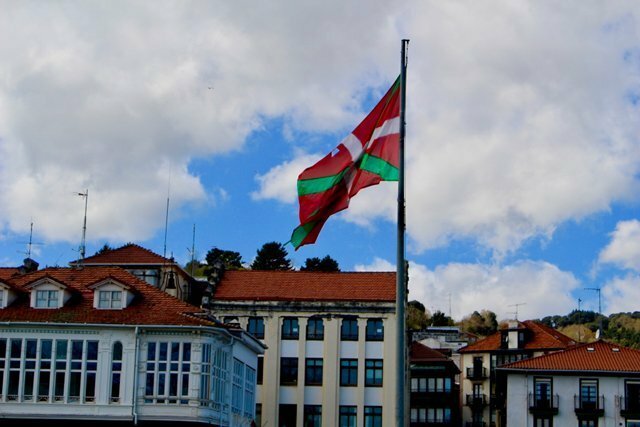 After the death of Franco, change rapidly swept through the Basque country. Once again the people were given their freedoms – and so was the Basque country. 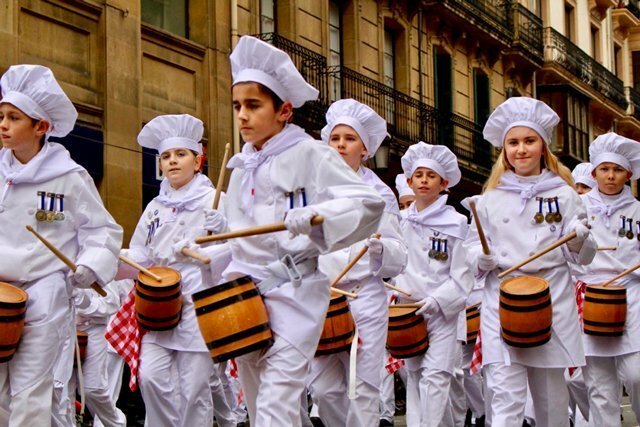 Today, Basque society and culture are once again thriving in San Sebastián. 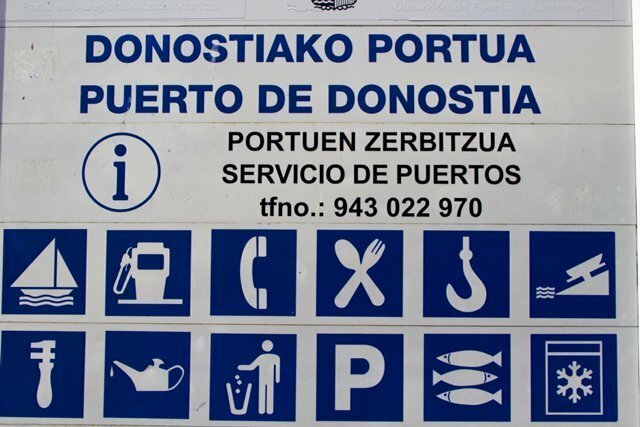 Unlike other regions in Spain, everything in San Sebastián has two names: in Basque and in Spanish. Around the entire city, signs are read in Basque first, Spanish second. The Basque people are full of pride. Tourist stores are not full of Spanish trinkets, but rather full of Basque symbols, Basque flags, and Basque jewelry. Since beginning my time in Spain, I have experienced Basque holidays, Basque dancing, Basque cuisine, and the Basque people themselves. Never in my life have I experienced festivities as cultured as Tamborrada – a holiday that takes place in late January. The festivities carried on for a twenty-four hour period from midnight on a brisk Friday night to midnight on Saturday. Everyone in the city participates in one way or another. Citizens dress up in various attire: bakers outfits, to colonial army attire, to 18th century women’s attire. Each person carries around some form of instrument – varying from wooden makeshift drums to trumpets. The Basque march around the city, playing the same three songs. Saturday morning, the children from every school in the city have their own march down the main streets. The story behind Tamborrada is an interesting one. The festival originated from the 1830’s were locals mocked the Napoleon’s troops that were stationed in the city. During this time period, it was typical for local women to fetch water from the central water pump. At the same time, the soldiers would march around the city banging their drums. The local women began mocking the soldiers, using utensils and water buckets as their own instruments. The city utilized this mocking and turned it into something quite large. Local culinary clubs began to form bands, as are seen in modern Tamborrada. 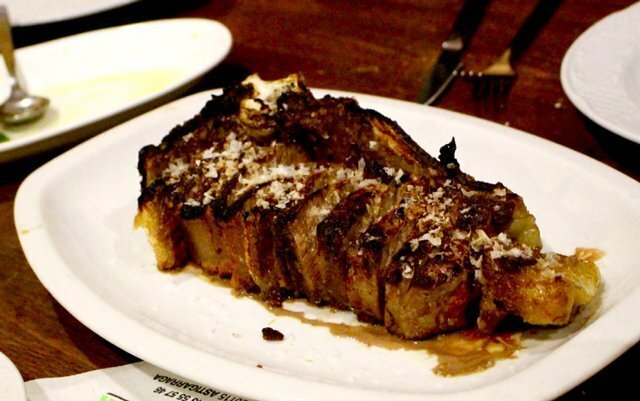 Another aspect of Basque culture is that of their culinary skills. San Sebastián happens to be one of the most highly regarded gastronomic destinations in the world. So not only did I have the opportunity to spend my time in a beachy city, I also got to experience some of the best food. *Insider tip, USAC offers a Spanish & Basque Cuisine class that I highly recommend! One of my favorite culinary aspects is that of the Basque cider houses. A cider house is a Basque-type of restaurant located on the outskirts of town. I did not know what to expect at one of these cider houses. Little did I know it would happen to be one of my most memorable experiences. At a cider house you are given utensils wrapped in one napkin and a glass. Throughout the night you are able to try various ciders made directly in the house, as well as a three-course meal, and an unlimited amount of bread. Cider houses happen to also be one of the most sociable events in the Basque country. Typically, a group of friends will reserve a table and enjoy a night full of food, cider, and laughs. 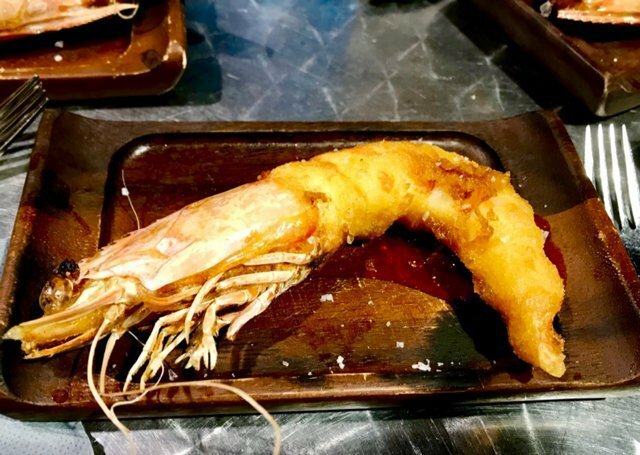 To me, the most unique aspect of Basque culture is that of Pintxo Pote. Pintxo (pronounced pincho) Pote, occurs everyThursday night in the bars of San Sebastián. Pintxos are small snacks, very similar to Spanish tapas. These snack-sized pieces typically consist of small slices of bread topped with seafood, chorizo, or Basque tortilla. On Thursdays, over 200 bars offer small food choices and a one cup of beer or wine. Unlike American drinking culture, Pintxo Pote is just another sociable event with your friends and family, like that of the cider houses. My friends and I always look forward to Thursdays as it gives us a chance to hang out with our local friends while enjoying great food. Experiencing Basque culture has been extraordinary. This culture happens to be very different from anything I have experienced in my college time, or even my entire life. However, after immersing myself in the culture, I realized how amazing it truly is. The people of San Sebastián are proud to be Basque and love to celebrate their culture in every way possible. Learning about my own heritage has make my study abroad experience that more incredible. 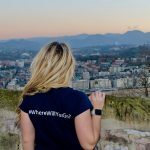 As my days and weeks studying abroad are coming to an end, I soak up the most of my experiences, attending as many sociable events with my USAC and local friends. 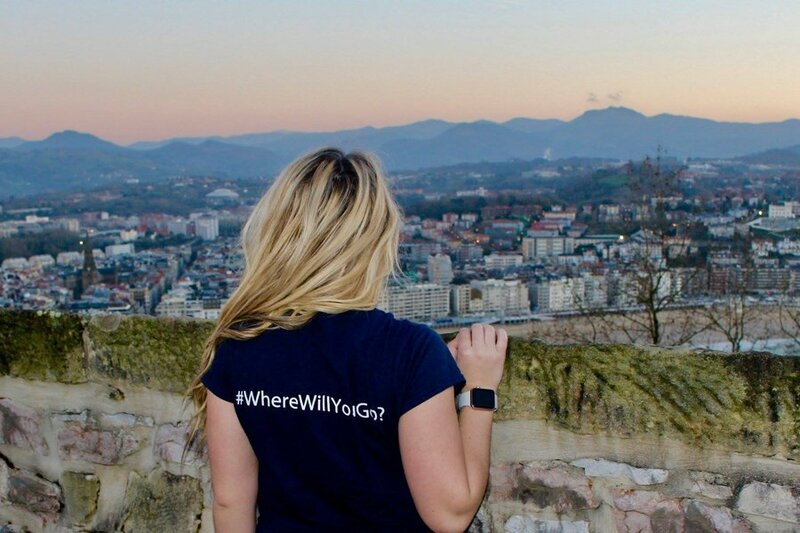 Jacquelyn Nader studied abroad in San Sebastián, Spain. She served as a Digital Communications Intern during her time abroad.